A shooting star flashes past the Jupiter. You can select different intensities in the View window. Full sky view of the constellations, their boundaries, the Milky Way. Mars in retrograde, 2009-10. 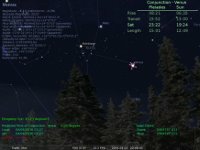 Track the retrograde moition of Mars through the constellations of Gemini, Cancer and Leo (Vesta in retrograde as well). For this script need statusLabel.inc file. A tour of Saturn and its larger moons. Requires mods to the ssytem.ini to create observing locations. This script based on data from book “Binocular Highlights” by Gary Seronik. Earth and other planet’s Greatest Elongations and Oppositions from Mars 2000-3000. Earth Greatest Elongations and Transits from Callisto 2000-3000. Why Callisto? Well of the 4 Galilean Moons, Callisto is the only one outside of Jupiter’s radiation belt. Therefore, if humans ever colonize Jupiter’s moons, Callisto will be the one. Earth the other visible Planet’s Greatest Elongations and Oppositions from Ceres 2000-2200. Cycle around the Galilean moons: Io, Europa, Ganymede, Callisto. The cameras cycle from inner to outer moons, pointing inward to the nearest moon. Io is the innermost of the four Galilean moons and points to Amalthea. It could just as well be pointed at Jupiter itself, but it’s a bit more dynamic when pointing at Amalthea. There is a 5-second wait before starting the cycle. Newer versions of Stellarium (I’ve tested this script on 0.18.0) seem to error out if the camera movements start right when the script does, so the delay gives the program a few seconds to “settle” before moving to the first camera. The last version that seemed to be reliable in this sense was 0.16. This zip contains two messier tours. One shows all the Messier objects, and the second shows just those objects that are currently visible. 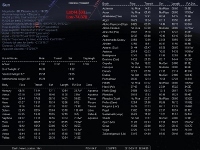 Extract the “messier-tour” directory, and move it into your Stellarium scripts directory. The planet Jupiter sometimes appears to be without moons, when the four Galilean satellites are simultaneously invisible because they are passing across the planet’s disk (transit), are behind the planet (occultation), or are in its shadow (eclipse). This script demonstrates these rare phenomena from 1900 to 2100 in Dynamical Time. Script will display the selected planet’s (currently only Venus, Mars, Jupiter and Saturn ) events like Opposition, Closest Approach, Start and Stop Retrograde, Quadratures, CoQuadratures, Superior Conjunction, Aphelion, Perihelions, Seasons, Top & bottom of Zodiac, Ring tilts and more. Includes ephemeris like Phase, rise, set, transit times, magnitudes and earth shine and more!! Phobos occultations of Earth are common, as are occultations of Jupiter. But occultations of both on the same day are very rare. Here’s one that takes place 1/23/2048. In real speed. Phobos races ahead of Mars and transits the sun, passes through it and then retrogrades back towards the sun and just partially transits it again (only seen in the southern hemisphere of Deimos), then Mars totally eclipses the sun while Phobos transits in darkness between Mars and Deimos. When Phobos emerges from Mars it is still eclipsed and dimmed in Mars’ shadow, only to light up later. Due to the quirks in Mercury’s orbit and rotation at certain spots the sun will rise & set 3 different times in one Mercury day.